I know that I have heard the term “red letter Christians” before, but I hadn’t really given a lot of thought as to its origins. This morning, I discovered to my surprise that I might be one. Older Christians (over the age of 40) still tend to think in terms of categories, such as liberal and conservative. There is a growing movement in America referred to as Red Letter Christianity. It is overwhelmingly a youth movement, and they wish that no labels at all would be used. But if labels are going to be employed, they reject the older categories that have marked theological debate. Many of these young people studying on secular campuses … find that if they define themselves as evangelicals … their secular colleagues immediately assume that with such a label, they must be married to the right wing of the Republican Party. The word “evangelical” conjures up the popular image of being anti-women, anti-gay, anti-environment, pro-war and connected with the National Rifle Association. While holding to evangelical beliefs — which include (a) holding to the view of the Bible that deems it inspired by God and hence free from errors; (b) accepting each of the doctrines of the Apostles’ Creed; and (c) holding that salvation comes only through a personal surrendering of one’s life through Jesus Christ, whose sacrifice on the cross delivers from sin — this group of young people is spread across the political spectrum. They do not see that being theologically conservative necessitates political conservatism. What isn’t stated explicity here (but will be worthy of more exploration on my part) is that “red-letter christianity” refers to people who anchor their lives to Christ and his teachings. 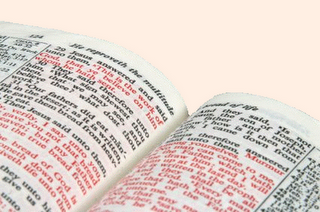 You see, it was once common to print Jesus’ words in red in the bible. I don’t know much about Tony Campolo – Ms. Flynn’s article refers to some positions he’s taken as being controversial within the church – but I certainly like and agree with his description of the changing face of the church. Those are red letters that I will gladly wear on my sleeve.